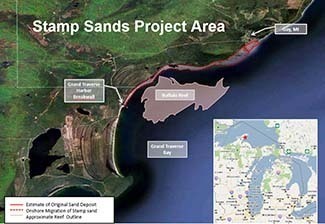 Relocate 175,000 cubic yards of stamp sands from the original pile perched over Lake Superior ($380,000). Dredge 25,000 cubic yards of stamp sands adjacent to the Grand Traverse Harbor breakwater in 2019, and again when needed – likely 40,000 cubic yards in approximately 2022 ($850,000). Develop beneficial use of the mine tailings to reduce or eliminate disposal costs by working with the U.S. Army Corps of Engineers to analyze physical, chemical and ecological characteristics of the mining waste ($700,000, including $500,000 from the General Fund appropriation and $200,000 from the U.S. Army Corps of Engineers). Improve understanding of how fish use the reefs by working with the Great Lakes Indian Fish and Wildlife Commission to identify portions of the reef and juvenile recruitment habitat used by lake whitefish and lake trout ($240,000). Develop a long-term management plan for protecting the reef ($500,000). 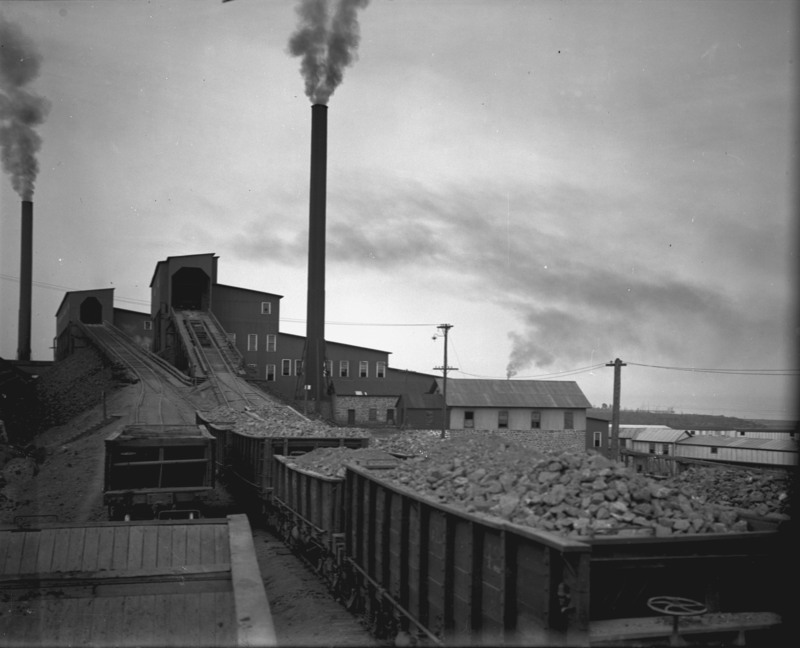 Determine percentage of stamp sands in Grand Traverse Bay by working with Michigan Technological University to analyze samples ($12,000). Perform additional dredging or help finance promising beneficial use pilot studies ($518,000). 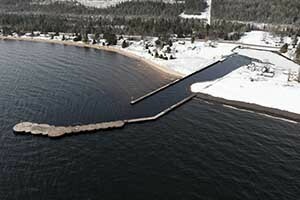 Recently, the EPA provided the Army Corps with an additional $946,000 in Great Lakes Restoration Initiative funding to award three options on a contract with Petersen Companies, Inc., of Minocqua, Wisconsin. The award of these options will permit Petersen Companies, Inc. to dredge an additional 50,000 cubic yards of stamp sands from the trough. The makeup of the steering committee has shifted in recent months. 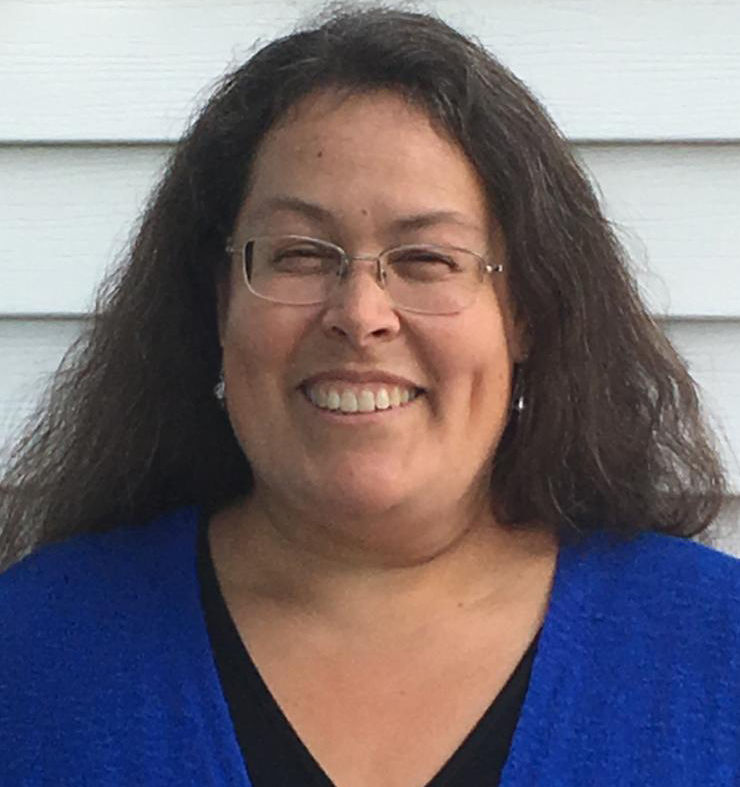 Evelyn Ravindran replaced Lori Ann Sherman, representing the Keweenaw Bay Indian Community. Sherman accepted a job as the president of Keweenaw Bay Community College. Ravindran was promoted from managing the tribal fish hatchery to Sherman's previous job as natural resources director for the Keweenaw Bay Indian Community. 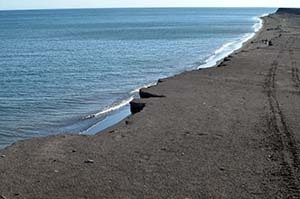 On a parallel track, the Buffalo Reef Task Force continues to work with parties to develop beneficial uses for the stamp sands. Such uses could reduce the cost of implementing the management plan while improving protection of the reef. Get more information on the ongoing effort to save Buffalo Reef at Michigan.gov/BuffaloReef. 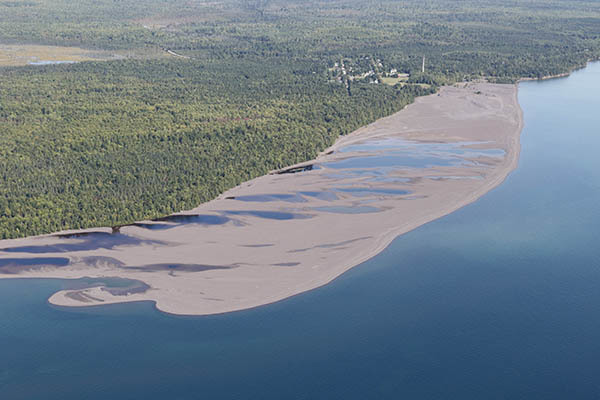 Visit a scientific webpage produced by Michigan Tech on the Buffalo Reef stamp sands issue. Coastline: The coastline along Lake Superior at Gay is covered with a thick layer of stamp sands, which extend south to the Grand Traverse Harbor. Friona: Tony Friona, Great Lakes liaison for the Army Corps’ Engineer Research and Development Center and Buffalo Reef Task Force Steering Committee member. 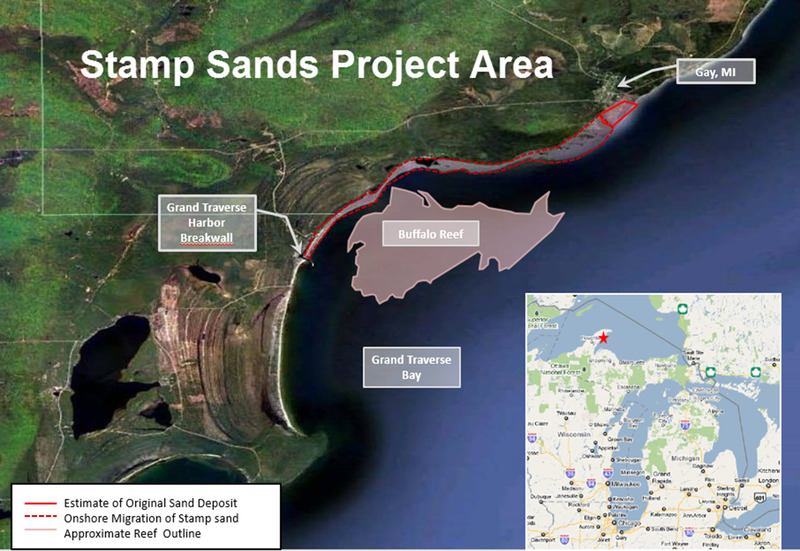 Map: A map shows the stamp sands project area and Buffalo Reef. 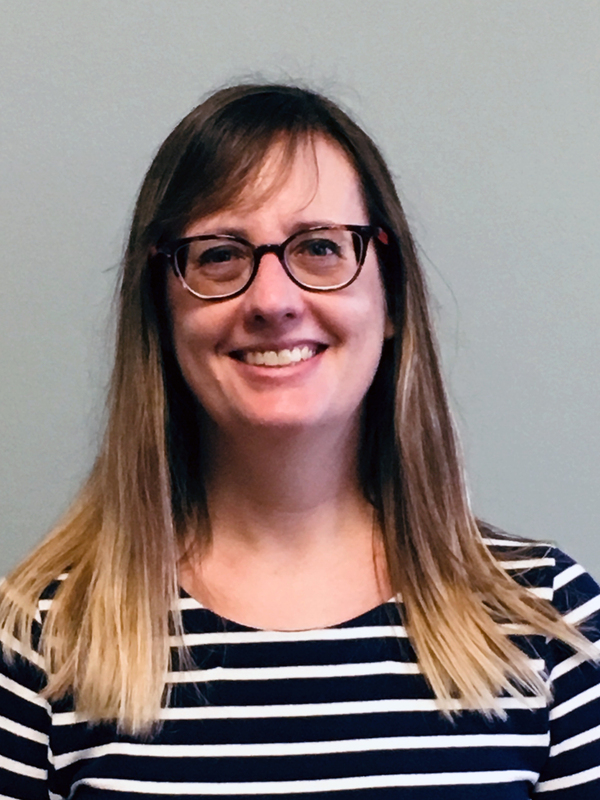 Ravindran: Evelyn Ravindran replaced Lori Ann Sherman, representing the Keweenaw Bay Indian Community, on the Buffalo Reef Task Force Steering Committee. Sherman accepted a job as the president of Keweenaw Bay Community College.